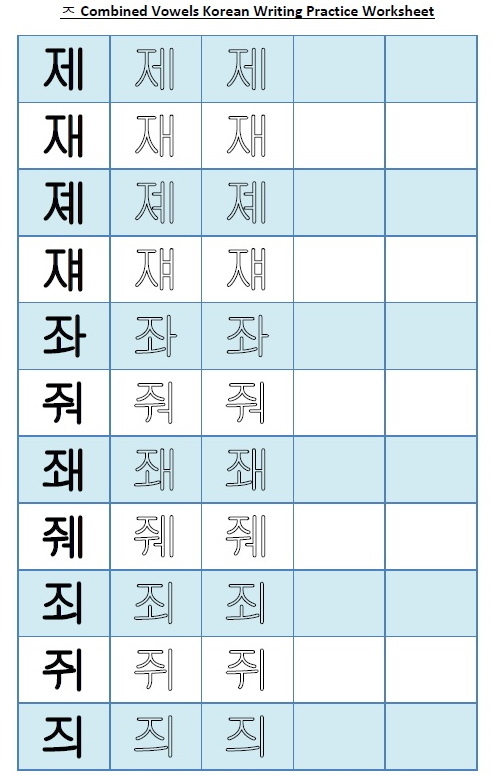 A few example words which include the ㅈ with combined vowels are: 제발 = Jae/Bal (Please – a strong version), 재스민 = Jae/Ser/Min (Jasmine) and 쥐 = Jwi (Rat). To catch up with our previous part 8 please click this link. A few example words which include the ᄋ with combined vowels are: 왜 = Wae (Why), 위스키 = Wi/Ser/Ki (Whiskey) and 웨일즈 = We/Ill/Jer (Wales – the Country). To catch up with our previous part 7 please click the links. This is part seven of our Combined Vowel Korean Worksheet Series. The seventh Korean character we are going to look at is “ㅅ” which sounds similar to an English “S“. This worksheet includes all the different possible combined vowel combinations. A few example words which include the ㅅ with combined vowels are: 새 = Sae (Bird), 세계 = Sae/Gyae (Buffet) and 열쇠 = Yol/Sway (Key). To catch up with our Combined Vowels Guide plus Alphabet Chart , Part One, Part Two, Part 3, Part 4, Part 5 and Part 6 please click the links. This is part six of our Combined Vowel Korean Worksheet Series. The sixth Korean character we are going to look at is “ㅂ” which sounds similar to an English “B“. This worksheet includes all the different possible combined vowel combinations. A few example words which include the ㅂ with combined vowels are: 뱀 = Baem (Snake), 뷔페 = Bwe/Pae (Buffet) and 베트맨 = Bae/Ter/Maen (Batman). To catch up with our Combined Vowels Guide plus Alphabet Chart , Part One, Part Two, Part 3, Part 4 and Part 5 please click the links. This is part five of our Combined Vowel Korean Worksheet Series. The fifth Korean character we are going to look at is “ㅁ” which sounds similar to an English “M“. This worksheet includes all the different possible combined vowel combinations. A few example words which include the ㅁ with combined vowels are: 매운 = Mae/Un (Spicy), 멜론 = Maer/Lohn (Melon) and 맥주 = Maek/Jew (Beer). To catch up with our Combined Vowels Guide plus Alphabet Chart , Part One, Part Two, Part 3 or Part 4 please click the links. Thank you for your time today and if you have any questions or comments please feel free to let us know. This is part four of our Combined Vowel Korean Worksheet Series. The fourth Korean character we are going to look at is “ㄹ” which sounds similar to an English “R or L“. This worksheet includes all the different possible combined vowel combinations. A few example words which include the ㄹ with combined vowels are: 레몬 = Lae/Mon (Lemon), 레이저 = Lae/Ee/Jo (Laser) and 뢴트겐 = Rwon/Ter/Gaen (X-Rays or Roentgen). There aren’t many combined vowels which go with the consonant ㄹ and then most are words taken from English. To catch up with our Combined Vowels Guide plus Alphabet Chart , Part One, Part Two or Part 3 please click the links. 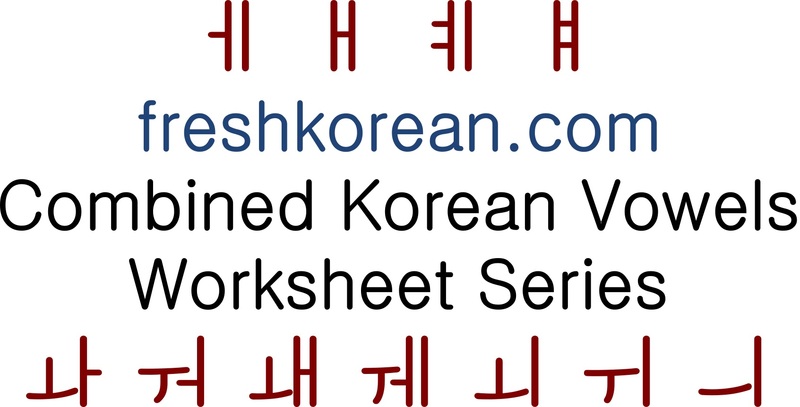 This is part three of our Combined Vowel Korean Worksheet Series. The third Korean character we are going to look at is “ㄷ” which sounds similar to an English “D“. This worksheet includes all the different possible combined vowel combinations. A few example words which include the ㄷ with combined vowels are: 대구 = Dae/Gu (Korea’s 4th largest city Daegu), 돼지 = Dwae/Jee (Pig) and 대한민국 = Dae/Han/Min/Guk (The country South Korea ^^). To catch up with our Combined Vowels Guide plus Alphabet Chart , Part One or Part Two please click the links.